Melbourne: Nico Rosberg capitalised on a slow start-off pole by world champion teammate Lewis Hamilton and superior tyre strategy over Ferrari to win the season-opening Australian Grand Prix on Sunday. 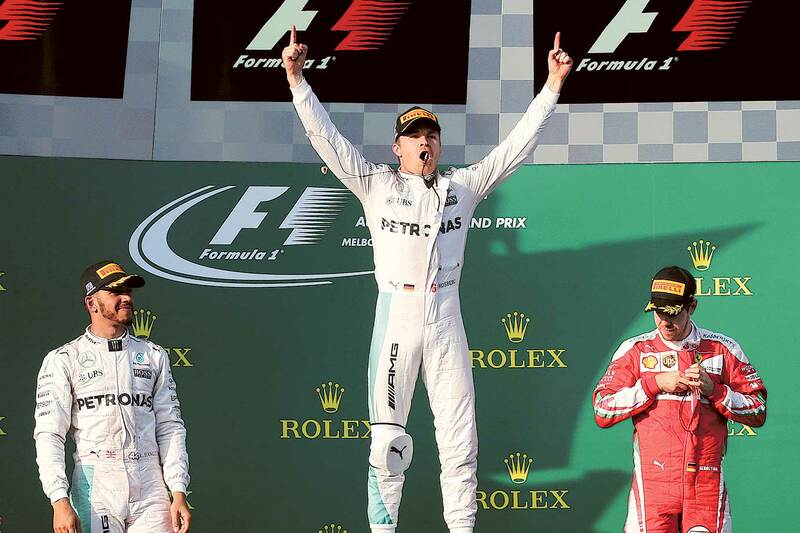 The German won his fourth straight GP and 15th overall after stringing together the final three races of 2015 to beat his Mercedes rival Hamilton by eight seconds. Ferrari’s Sebastian Vettel, who led off the grid and was faster than the Mercedes pair on his super softs before needing a tyre change on lap 36, was third. It was an incident-packed race with McLaren’s double world champion Fernando Alonso walking away from a horrifying high-speed crash and Kimi Raikkonen’s Ferrari catching fire in the pit lane. The dominant German team has now won 33 of the last 39 races and it was a sweet triumph for Rosberg, who has trailed Hamilton in the drivers’ standings for the past two seasons. “The strategy was crucial today and I am truly thankful to the team and there was a tyre choice on the red flag and I was happy to follow up with the mediums,” Rosberg said. Australian Daniel Ricciardo was fourth in his Red Bull, with Brazilian Felipe Massa fifth in a Williams and Romain Grosjean sixth for the newcomers Haas. Hamilton, who had led every practice and qualifying session for the first race, was slowly away allowing Vettel to dart through a narrow opening between both Mercedes to beat them to first turn. Rosberg locked up on the inside of the first corner, forcing Hamilton to back off and allow Raikkonen to pass them both on the exit to the sharp right-hander. Hamilton’s loss of momentum cost him two more places to Max Verstappen and Massa. “I loved the fact we had to come from far behind. I’ve had much worse in the first race and I’ll take it as a real bonus to come back from seventh,” Hamilton said. Alonso had a heart-stopping moment on lap 17 and was fortunate not to be seriously injured in a spectacular shunt with Esteban Gutierrez in a Haas approaching turn three. Alonso’s McLaren veered into the wall and went into a series of violent rolls before it flew through the gravel trap and slammed into another barrier disintegrating upon impact. The twice former world champion was shaken but unharmed and quickly clambered out of the barely recognisable wreckage. The race was red-flagged and cars returned to the pit lane while considerable debris was cleared from the track. The stoppage wiped away the Ferrari pair’s advantage - and planned tyre strategy - with the entire field able to change to fresh rubber before restarting behind the safety car with 18 laps of the 57 gone. Indonesian rookie Rio Haryana failed to rejoin, however, with his Manor car experiencing driveline problems. Vettel, still on the softest compound, again established a lead after the restart from Rosberg, Riccardo and Verstappen with Hamilton sixth. Raikkonen’s Ferrari came into the pits with flames coming out of the air box of his car and the Finn appeared unflustered while a marshal extinguished the fire above his head as he exited the cockpit to retire. Vettel stretched his advantage on lap 26 to 3.7sec over Rosberg, but his Ferrari began to struggle on his fading super-softs with Rosberg, who would not have to stop again on the medium compound, closing the gap. Vettel pitted his Ferrari on lap 36 and rejoined the race on soft tyres in fourth leaving Rosberg in front. Hamilton, now up to third on his own mediums, passed Ricciardo for second on lap 42 to lie 10sec behind Rosberg with Vettel 15.8sec off the lead. Vettel, with fresher rubber, closed on Hamilton but his challenge ended with two laps to go when he locked up at the penultimate corner and ran wide on to the grass.